An early vision of IIT was to give back to the local community by preparing teachers to teach science and math in the surrounding Bronzeville area. During my initial discussions with IIT prior to joining the university, I stressed that IIT needed to have comprehensive master’s and Ph.D. programs in science and mathematics education. I knew that the biggest market for our Mathematics and Science Education (MSED) department would be teachers already in the area who would be looking to develop professionally. President Lew Collens shared this vision. 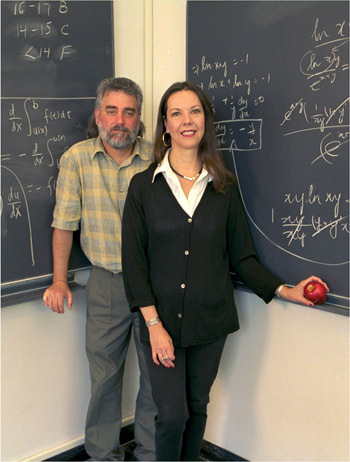 With two faculty members and nine students, we offered our first class in spring 2002. Since then, we’ve had a variety of successful programs, some with Chicago Public Schools (CPS) and some that extend further. We have a National Science Foundation grant with Western Michigan University and a variety of other projects where we evaluate grants at other organizations, such as the Brookfield Zoo and the University of Illinois. due to the esteem in which our faculty and graduates are held. Our faculty have been on the board of directors of the National Association for Research in Science Teaching and the National Science Teachers Association, and have edited scholarly journals. Another distinguishing factor is that all of our faculty are former teachers; we will not interview people who have not taught in public schools. Since we educate teachers, we want to make sure our faculty are experienced in this area of instruction. We have 44 Ph.D. students, which makes us the biggest Ph.D. program on campus. Seventy percent of our doctoral students work in CPS. Two of our Ph.D. students have graduated: one is working at Loyola University, the other at Roosevelt University. The growth of our department is impressive given our short time in existence, and is a tribute to my colleagues, our students, and Lew’s commitment. We have forged collaborative relationships overseas—research projects or faculty exchanges—that involve the Stockholm Institute in Sweden, the University of Hong Kong, and National Chang Hua University in Taiwan, among others. But our collaboration is local as well as global. For example, we have a post-secondary education grant with the Biomedical Engineering department in conjunction with The Biotechnology Institute in Virginia. We also are working with members of the Applied Mathematics department on co-sponsoring a Ph.D. program in Applied Mathematics. As designed, our biggest program today is our master’s program. Today, we have about 80 students, and true to the original vision of IIT, a large proportion of them are CPS teachers in Bronzeville. Lew has been, from day one, the most supportive administrator at any level with whom I’ve ever worked. My prior experience was that if the president phoned to talk to me, I must have done something wrong. When Lew calls, it’s about something he’s heard or read, and he wants to know if there is anything that can be applied at IIT. I always take his calls.